Current family has owned for approx. 10 plus years. Last owner was a good friend and lives only 10 miles away, and previous owner to him was only 60 miles away. Owner has two binders of past records. 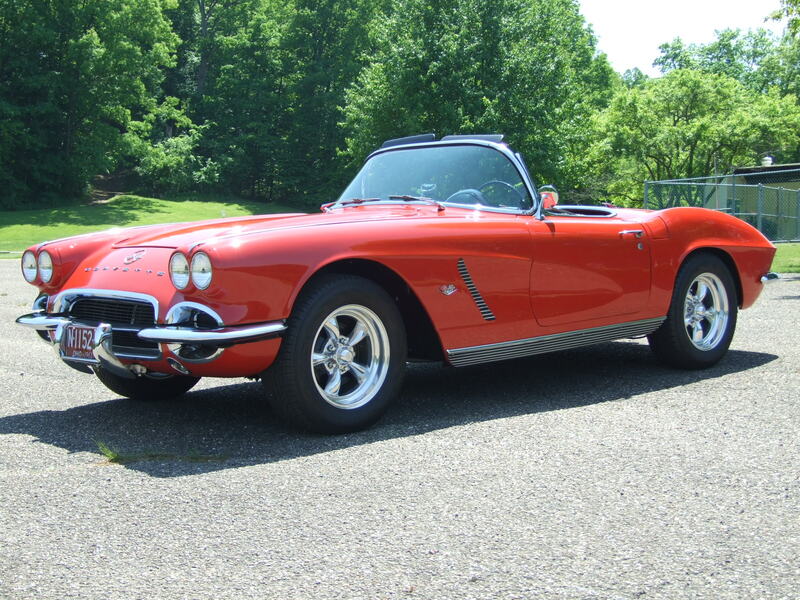 Owner and friends (both Corvette specialist) performed maintenance, and chassis restoration. 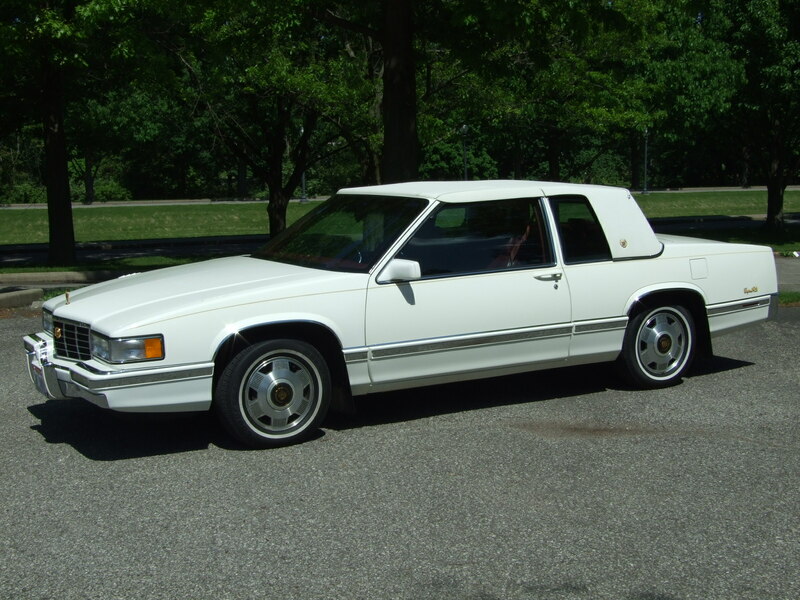 The body and interior has mostly been left stock, but included as we would call kinda “Old School” with the type of wheels and engine modifications that where very typical in days past with these cars and is again very popular today. * The paint is extremely smooth, shiny, and matches beautifully all the way around the car. We see virtually no orange peel, and without a question was professionally applied. The finish polishing was expertly done as well. * We do not see any defects in the actual workmanship itself. * We do not know the actual age or type of paint. * We took a lot of the pictures in the shade at an angle so with the reflection you can see how beautifully straight the body is on this car for an early 60’s Corvette. In the bright sunlight pictures you can see the color. * The fits and gaps around the doors, trunk, and hood all appear to be what you would typically see and all seem to be in typical ranges. * All of the glass is very nice and clear, with the side glass all having the LOF safety plate emblem, and the front windshield being a Pilkington. * We do not see any cracks, wiper marks, scratches, bull-eyes, or delamination in any of the glass, and it is again very nice and clear. The front windshield maybe having a few pin head size nicks, which is pretty typical if you drive a vehicle. * Trunk does have a spare tire, as well as an older original style correct mat, and typical wooden cover over top of the wheel. The trunk appears much as it would have in the day. * The white coloring all looks good, and even all around. I did not notice any fading on the top. * The seams and stitched areas are all in good shape, and looks as the top has just a minimal amount of wear. * The top is nice and soft without cracking, and the paint on the frame work looks very nice. * The frame certainly looks as thought it may have been painted when the top was installed. * Car does not have a hard top. * The convertible top is vinyl, but we do not know the age of it. * Upon putting it up, it appears it has not been up for several years. * It needs a little cleaning which is typical of a white top that has been stored. * The top is manual. * The rear glass is very nice, and clear without any smokey or yellowing look to it. * If the top was left up, and put out in the sun, a lot of the wrinkles would clear up to some degree. 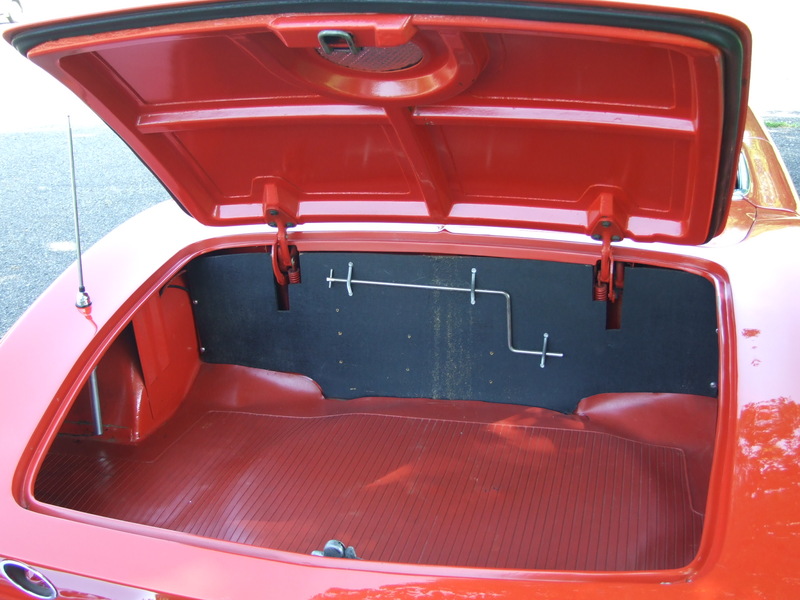 * The vinyl on the seating and the sides panels is all very nice and presentable, and does show very well. 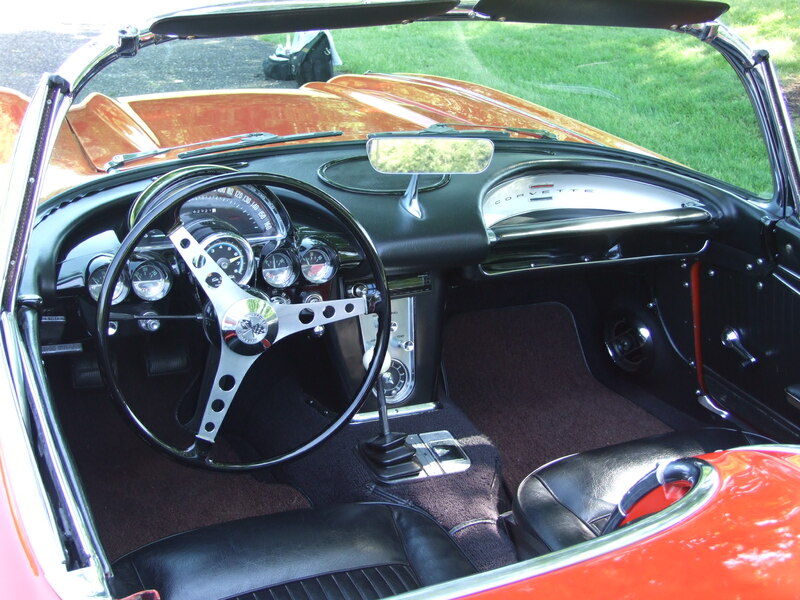 * The kick panels have been modified with the radio speaker inserts. * The carpeting all has very little wear, and just maybe a slight touch of normal fading that you will get with black. * The passenger grab handle has a little bit of wear and tear on the right side. (See pics) The dash top looks like it has been recovered. * The black paint around the drivers instrumentation is so nice and shiny it would be our guess that it has been repainted. * Looking up close at the pictures of the gauges, they look as though they have been restored at some point, as they have good shine, clear glass, and the colors are good on the backround. * There is an upgraded radio, and mounting of a sun tach in the column as a replacement of the factory style. * All the knobs show a little bit of age, but very minimal. * Does have a nice Hurst shifter, and ball with a very short travel which makes it fun and easy to drive. * The steering wheel has a couple of hair line cracks where it meets the aluminum center, but other than that all the way around we do not see any damage. 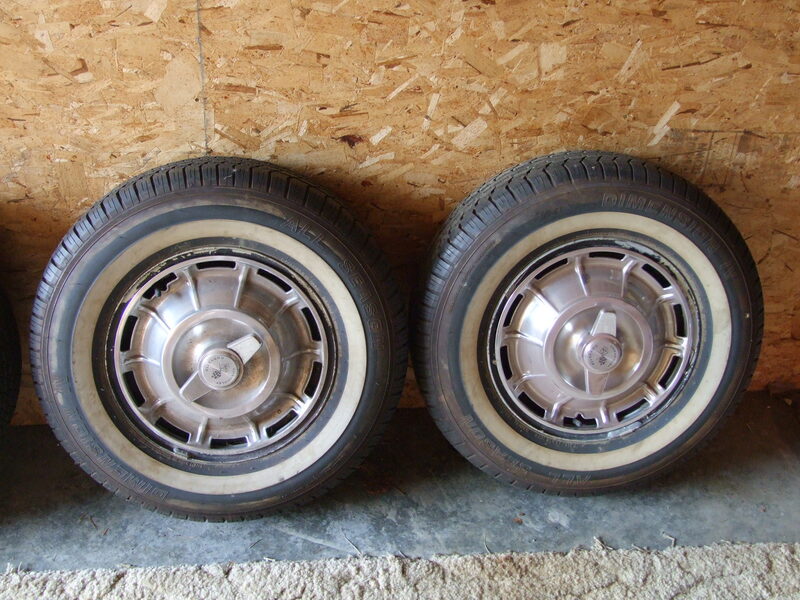 The alloy portion is in very nice condition. * The wheels are American Racing and do have a key lock. * Look at the pictures for tread remaining. 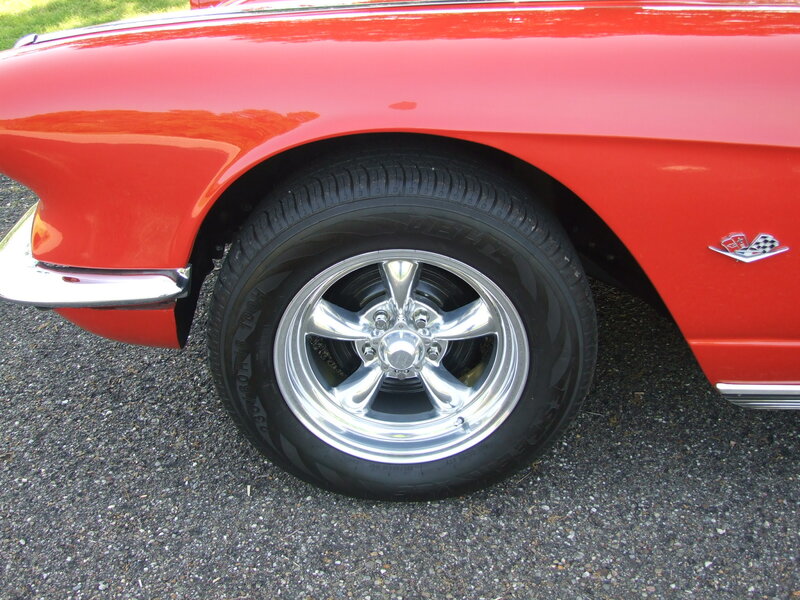 * The wheels and tires do not look damaged in anyway, and we did not notice any cracking on the tires sidewalls. * The finish looks good and shiny, and it looks like the right rear could just use a little more polish than the others, but otherwise look outstanding on this car. * Under the hood just jumps out at you and really looks good! 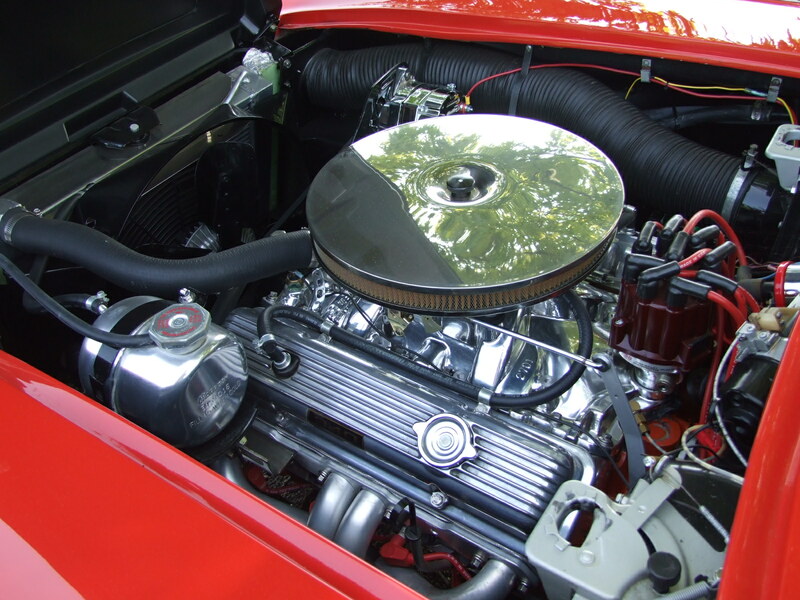 * Under the hood the firewall is a shiny paint, with an upgraded ignition system. 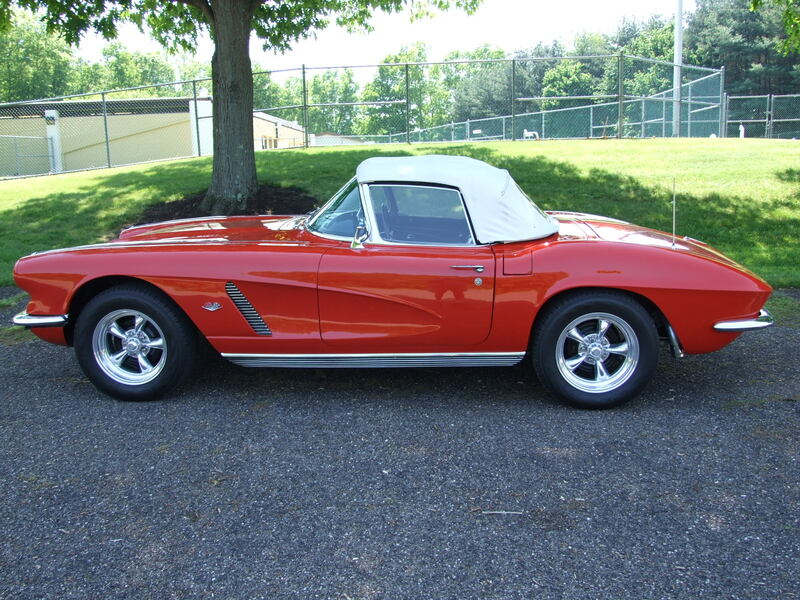 Includes polished intake with polished coolant tank and alternator. 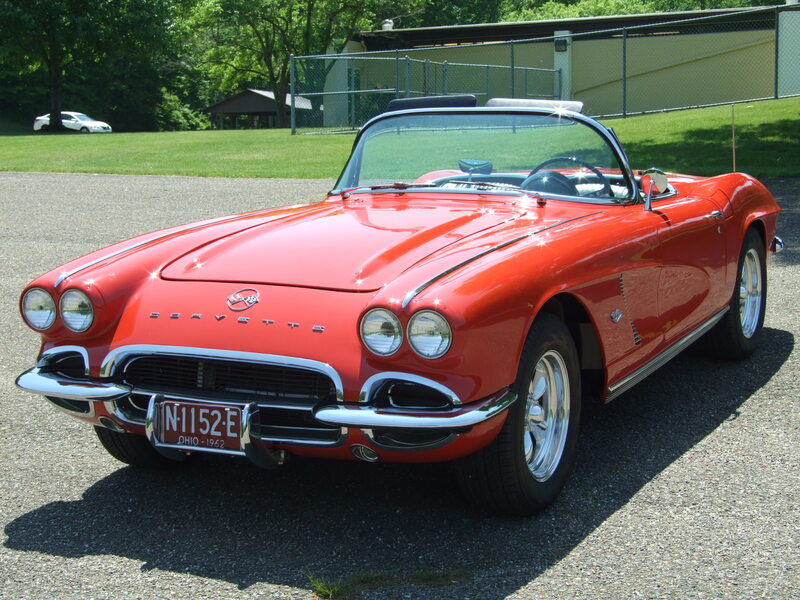 * There is an upgraded fuel line components, as well as the polished Corvette valve covers and coated headers(Hedman Headers). The 350 horse stickers we do not have any verification if the power is more or less than that number. * The quality of the paint on the fan shroud, fan pulley, and engine support are all either nicely painted or powder coated(not sure which). You will see it also has the newer style upgraded aluminum radiator as well. * If you look, we have photos of the approx. 10 year old restoration of the chassis and members. Thought it does not look exactly like it was when it was completed, the restoration has maintained and held up extremely well. With a little bit of detail cleaning, touch up, and elbow grease somebody could bring it back to what it looked like at the time. (Current engine installed after frame restoration). * You can see the attention to detail with nuts and bolts, stabilizer bars, hardware, etc. * The chassis was all done in a nice gloss black that has held up well. * The fiberglass underside was pretty much kept uncoated, and not covered over so you can see the quality of the originality. * In the front you will see the springs, brake lines, steering box, different nuts and bolts, and how it was detailed. * There might be a drip here or there from the rear main, transmission, or rear end once in a while, thought we do not see any extravagant leaks. * Notice it does have more modern shocks, as well as a high quality exhaust. 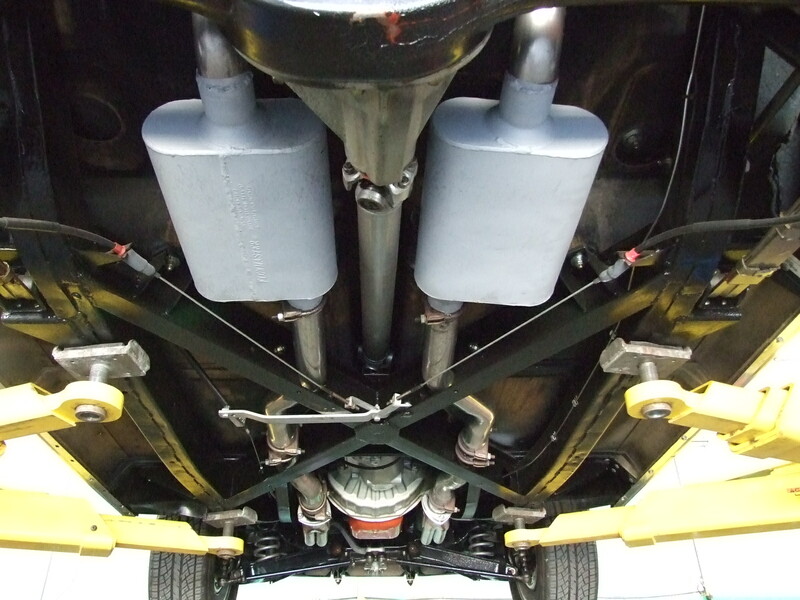 * The rear end does have a label that it is limited slip, and use only specific oil that is required for that. * You will see the attention to detail around the engine and transmission etc. * Locking mechanism for the hood staying up and the hood release does work, and is adjusted correctly. * Starting cold the oil (around 1500 rpm), pressure at 60 lbs. Upon idle with the engine hot the oil pressure is around 35. * The top is mechanical and hand operated and does go up and down properly, and all 4 latches work fine. The car starts and appears to be running correctly. The car does have a little bit of lumpiness to it, which feels like a performance camshaft. It accelerates very nicely, and runs as you would expect it to. The clutch catches easily, and not far up from the floor. It has medium resistance but works very smooth and seems to be operating properly. The transmission shifted into reverse and into all 4 forward speeds very smoothly without issue. Upon braking it is a 4 drum set up that appear to be adjusted well, and it stops very nicely with minimal effort. The steering is manual and has a very quick precise feel to it and seems to be set up properly as you get a response very quickly without a lot of play in the steering. Not easy to parallel park but a very fun car to drive. Chad drove it several times for approx 15 miles total.